This is my entry for the latest challenge from Karin Jurick's blog, Different Strokes from Different Folks. This mystery artist will also paint a portrait of me from a photo that I submitted. I remember looking at all of the amazing portraits that were painted last year and knowing that I would want to participate should Karin do it again. What fun this was and I can't wait to find out who my mystery artist is. UPDATE 12-29-09 Suzy Charto is my mystery artist! Here is the link to the painting she did from my photo. Her blog is so fun to read. Oh, and this is really cool. 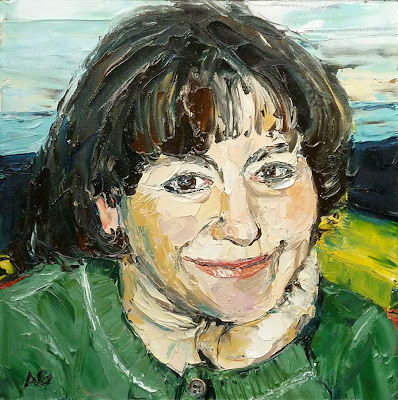 Karin is making videos of all of the portraits and posting them on You Tube. There are 4 parts to the series. Check them out! This lovely couple was married in June and their theme song was "At Last". Well of course I've had that song in my head for the last several weeks as well as the entire time I was painting, but then again, it is a great song. 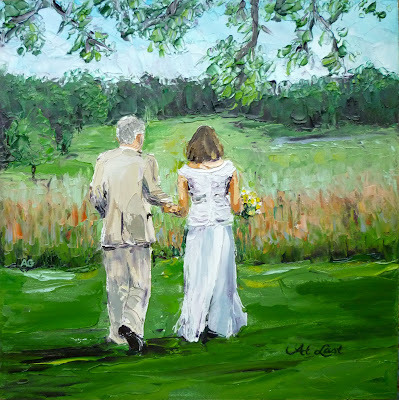 The bride's sister commissioned me to paint this as a Christmas gift for her sister, just like the other wedding commission I posted a few weeks ago. Sisters are awesome. 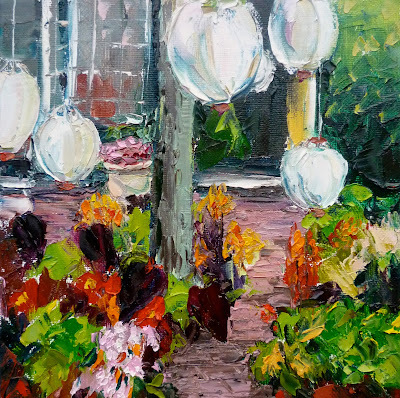 I painted this from a photo I took on Nantucket this past summer. This restaurant had the most beautiful sidewalk garden with big white hanging lanterns that caught the attention of my camera. I sat down to paint this knowing it was going to be a hard read if you hadn't seen the picture, but it was so full of crazy colors and textures I wanted to give it a shot with my knife. 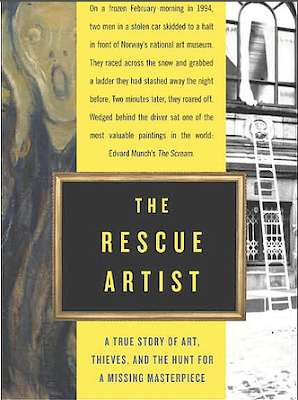 I just finished reading this book, The Rescue Artist by Edward Dolnick which was recommended by a fellow blogger (Thanks Katie May!). Interesting read about the theft and recovery of Edvard Munch's famous painting, The Scream. • The Scream is painted on cardboard with tempera and oil pastel? • someone (not Munch) wrote on the painting "This must have been painted by a madman"? • there is candle wax in the bottom right corner where he blew out a candle after working on the painting into the night? 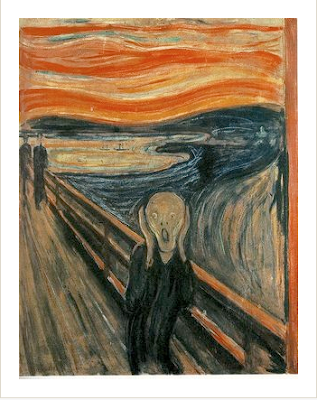 • Munch actually completed 4 Scream paintings? • The vivid red sky he saw and painted is believed to have been caused by debris from a volcanic eruption in Krakatoa in 1883? This fragile painting, even though it was removed from it's frame, was recovered without damage by the undercover detective Charley Hill. Hill is from England, yet he was posing as an American from the Getty museum and it was funny to read about what he needed to do and say to make himself believable. A few interesting trivial tidbits: Did you know that the word "horseshit" is apparently only used by Americans? And that Americans switch the fork to our right hand only after cutting our meat? As a lefty-I was surprised by this because I cut and eat with the fork in my left hand. The book weaves in many other art theft and undercover operations of Hill's as it develops the story of the recovery of The Scream stolen from a museum in Oslo the day that the winter Olympics started. Two men simply put a construction ladder up to the window on the second floor, took the painting, and vanished. Hill has also been working on the recovering the paintings that were stolen from the Isabella Stewart Gardner museum which has remained unsolved since 1990. Hope he can crack it someday! 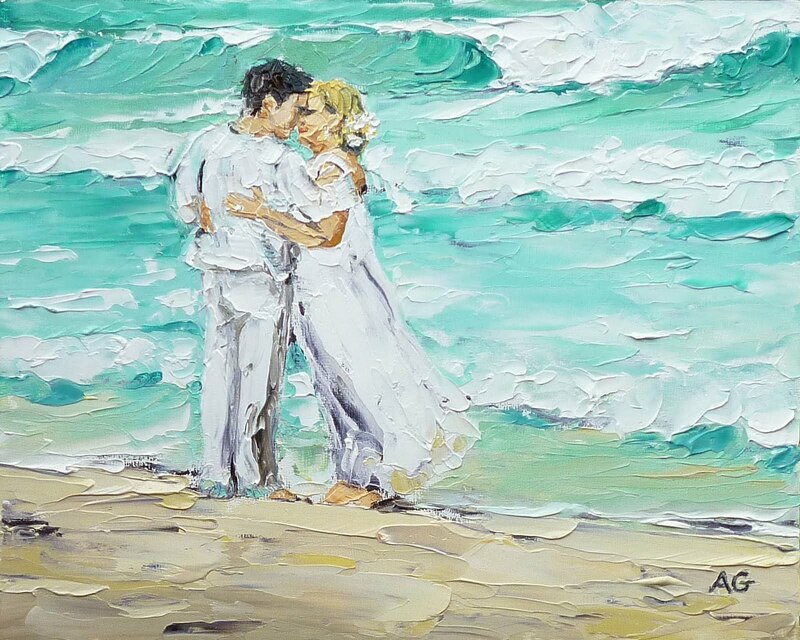 This lucky couple got married in Mexico last year and as a special remembrance, her sister wanted a painting done of them together on this beautiful beach. She is going to give it to her as a Christmas gift. What a nice sister! In my continuing effort to encourage others to buy local and handmade this year, here is another great place to do your holiday shopping. Check out Boston Handmade Downtown store through December 24th for some locally made, super creative gifts. Also-check out the video that Nancy Rosetta has posted on her blog to give you an idea of the great items you can find there including her fantastic, one-of-a-kind jewelry.